In the preview for episode 6 of Dragon Ball Heroes we see Goku UI handling Super Saiyan 3 Cumber. This is the same Goku who fused with Vegeta fought Cumber before. When Goku was fused with Vegeta, they used kaioken times 50 IIRC. And they were fighting Cumber in base form, which is 50x2x4 = 400 times weaker. This means Cumber SSJ3 is (400x50) 20000 times stronger than Vegito Super Saiyan Blue. And this Cumber SSJ3 was being handled by an unfused Goku Ultra Instinct. Now according to Wiss, fusion multiplies the power of the warriors "tens of times". That's at the very least a times 20 multiplier. Assuming this lower bound for the sake of the math, that makes Super Saiyan Blue Goku to be at the very least 20x20000 = 400000 times weaker than Cumber SSJ3. But then Goku Ultra Instinct was handling Cumber SSJ3, so the multiplier from Super Saiyan Blue to Ultra Instinct in Dragon Ball Heroes has to be at the very least 400,000. And it could be much more. If the fusion multiplies by 50, it would be 1,000,000 . If the fusion multiplies by 100, it would be 2,000,000 . Now, this doesnt look at all as the power boost Goku got in Dragon Ball Super from Super Saiyan Blue to Ultra Instinct. Then my question is, is Dragon Ball Heroes Goku Ultra Instinct way stronger than Dragon Ball Super Goku Ultra Instinct? I think you're reading too much into this. First, consider that Dragon Ball Heroes is a non-canon promotional anime. The scenarios within aren't necessarily supposed to be consistent, they're just supposed to be cool and promote the game, Dragon Ball Heroes. Because of this, it makes the most sense for Goku to go through all of his forms before gaining the upper hand on Cumber. This includes all of his Super Saiyan forms, as well as Vegito and Ultra Instinct. As well, consider that Akira Toriyama has never been totally consistent with the exact strength that the Super Saiyan transformations grant to their users, and he has been inconsistent in general with how strong characters are throughout the series. For example, back when DBZ: Battle of Gods was released, Akira Toriyama stated that in terms of power, Super Saiyan God Goku was a 6, Beerus was a 10, and Whis a 15 (source). If this were still true, SSJ Blue Kaioken x20 Goku should absolutely destroy both Beerus and Whis at the same time. Clearly, this was just a rough idea he had, and it was retconned as Dragon Ball Super continued. To answer your specific question, I would say that it's impossible to judge the strength of Dragon Ball Heroes Goku relative to Dragon Ball Super Goku. Dragon Ball Heroes is not concerned with coherence and consistency as much as it is cool scenarios, and thus, characters will be as strong or weak as the plot needs them to be. 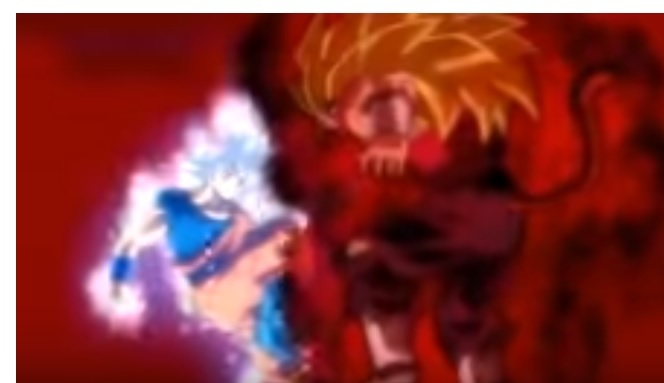 We first see SSJB Goku fight SSJ4 Xen Goku. In the manga, SSJB Goku ends up victorious making him the stronger off the two. We see Base Cumber holding his own against SSJB+Kaioken Vegito(Which is technically 2 SSJB Vegito's). Then we see Goku turning SSJG and attemption to fight Cumber and actually trades a few blows with him which makes no sense. Not the answer you're looking for? Browse other questions tagged dragon-ball-series dragon-ball-super dragon-ball-heroes or ask your own question. Did Hit grow weaker or did Super Saiyan Blue Goku get way stronger?